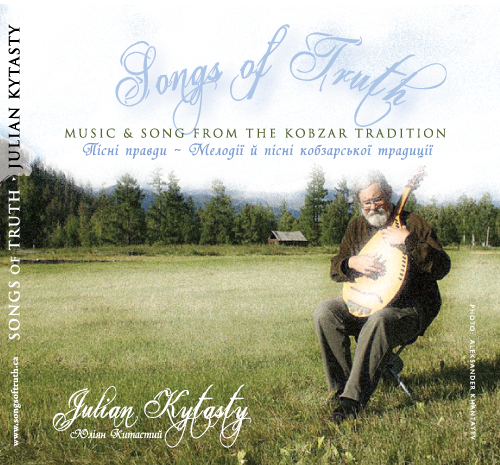 Songs of Truth is a collaborative production of world-renowned bandurist Julian Kytasty and Canada Research Chair in Communities and Cultures, Marcia Ostashewski. As a doctoral student, I contacted Julian because I was interested in contemporary Ukrainian music production in Canada, particularly musics with transnational connections. Since that time, Julian and I have worked together on a number of public outreach and education projects. More recently, I have been working with Julian on various creative projects – including a CD! I am so very humbled to be working with such an accomplished musician – and also very proud to see this extraordinary project come to fruition. Songs of Truth was produced in partnership with The Centre for Cape Breton Studies (Richard MacKinnon, Director). Julian Kytasty and Scott Sharplin’s collaboration is a mixture of theatre arts and musical virtuosity. Kytasty’s ability to mix storytelling, masterful bandura instrumentals and Sharplin’s clever spoken word are featured in this performance from Griots and Kobzars at the Boardmore Playhouse. These songs are featured on the new album Songs of Truth, produced by Dr. Marcia Ostashewski.